Legendary concept artist Syd Mead can be credited with creating some of the most memorable sci-fi movie worlds ever. Tron, Aliens and Blade Runner were all Mead’s work and all helped set new precedents for science fiction movies. 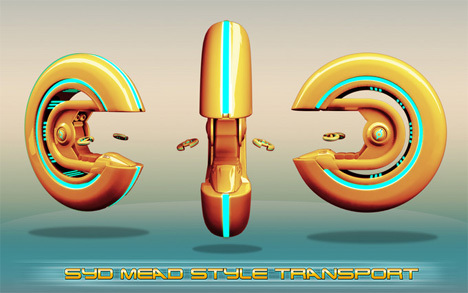 Now, a new generation of concept artists is paying homage to Syd Mead in the most significant way possible: by creating a ton of new ideas for future transportation in the style of the legendary futurist. 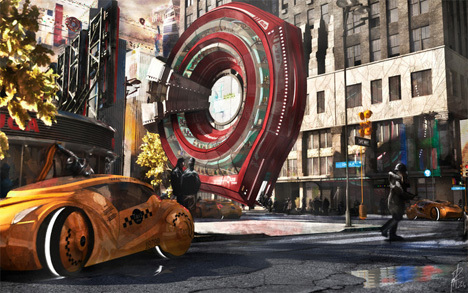 CGSociety’s Accelerate contest asked digital artists to come up with their Syd Mead-inspired visions of how humans may get from one point to another in coming generations. These are some of the most interesting entries from the contest. 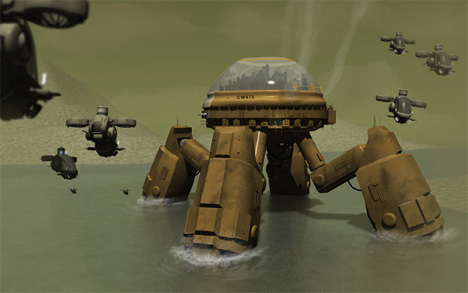 Inspired by Mead’s hulking machine concepts, the creator of the NOMAD concept styled this vehicle to be a high-capacity mobile bridge and landing pad. Running on nuclear power, the vehicle can keep going for quite some time – even when working constantly. It builds roads, it scouts new locations, and it carries vehicles and supplies to where they need to be. 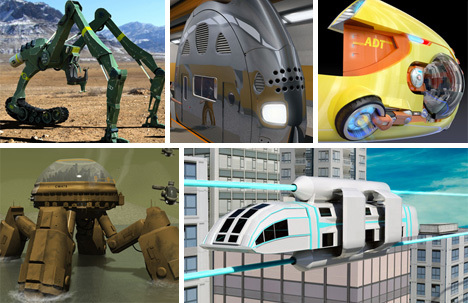 Is this what public transportation will look like in the future? Or is this merely a fantasy world in which we commute between work and home in flying metal doughnuts? 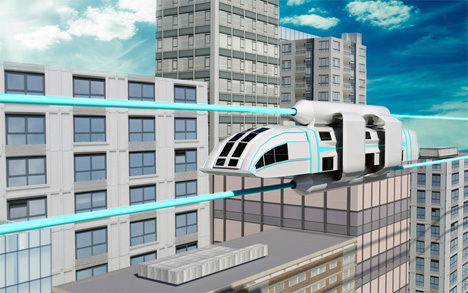 This transportation concept assumes that most of us want our commutes to be shorter, so we will eventually develop transport systems that allow us to travel large distances in the blink of an eye. Linking your cars to others in a convoy would allow the lead vehicle to take over while all following drivers could simply sit back, relax and read the news on the way to work. 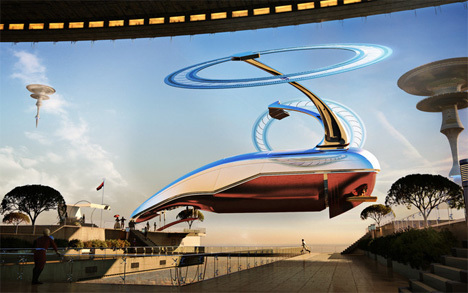 Sound wildly futuristic? A similar system is being developed and tested currently in the EU. 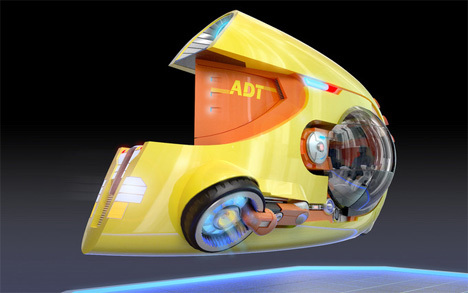 The cars in that trial aren’t nearly as cool as the ones in this concept, however. An ingenious idea that could save untold amounts of money, manpower and data, the Autonomous Database Transport vehicle was invented 2137 to deter the unmanageable number of hacker attacks. The ADT achieves this by going in a surprisingly backward motion: by physically transporting important data for government and private clients. 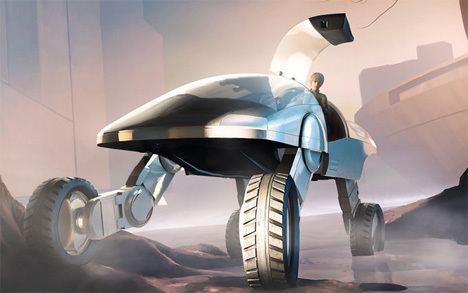 The Halo 49 single person transport is very strongly reminiscent of an actual Syd Mead transportation device, but it is also a unique new concept. Riders are seated in the Pac-Man-shaped vehicle and use two wireless disks to navigate to their destination. 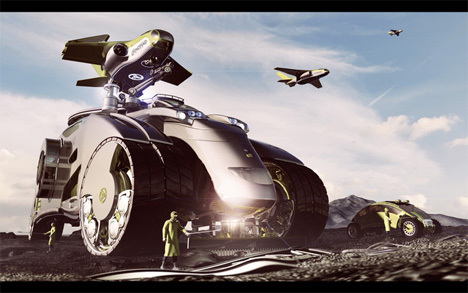 Law enforcement officials of the future may have to deal with vastly different terrain, either here on Earth or on different planets, so it’s important for them to have a vehicle that can get them anywhere they need to go. The Trakker all-terrain vehicle can roll over just about anything in its path and get you to the most remote places on the ground. In the near future, we won’t need to rely on archaic means of space travel that can take thousands of years to reach distant destinations. 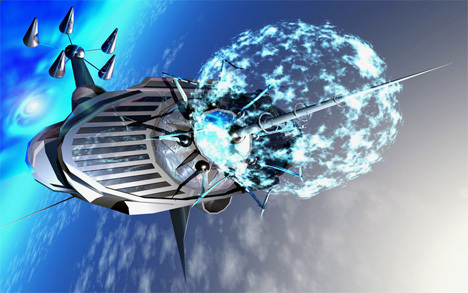 We’ll simply use vehicles like the Spacetime Runner which uses wormholes as “shortcuts” to other places in space-time. Assuming we’ll still be recycling the traditional way in the future and we haven’t yet developed some programmable trash-degrading bacteria, we’ll need vehicles to collect our recyclables. 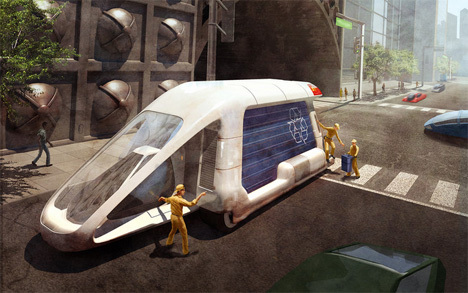 This simple, common-sense design shows that even garbage collection trucks look awesome in the future. When the Earth’s resources have been used up and the planet is in peril, humanity takes to living on walking cities. Using trees and plants harvested from Earth, each moving city has a breathable atmosphere inside its shell. The cities fertilize the planet they walk on with the waste created by the humans within. In the year 2112 a new mineral was discovered on the moon. This mineral made a new type of high-powered laser possible; it’s so high-powered, in fact, that it supports this “green” urban train. Special buildings all around the city emit the lasers which can be re-routed when necessary. The Vimana 2 is a vehicle built of solid light that explains many of the mysteries of previous generations. The vehicle is cheap and lightweight, but it has the pesky effect of causing reflections that burrow their way through the space-time continuum. In the 20th and 21st centuries, these strange lights in the sky were misinterpreted as UFOs. Definitely inspired by the shape of Mead’s creations, the MD 400 train concept is a truly beautiful example of future transportation. 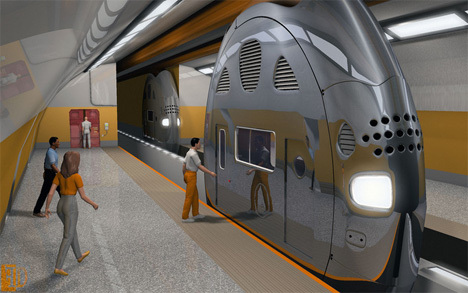 The thin trains hold fewer people than traditional subway cars, but mag-lev technology lets them move quickly and silently through their tunnels. 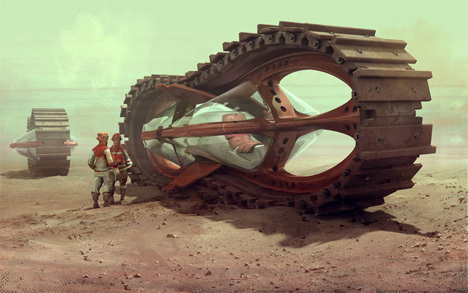 In a dystopian tale that would make Syd Mead proud, the creator of this concept explains that in a civilization called Praetoria, the surface of the planet is no longer safe. It is highly polluted and filled with gangs, forcing the wealthy to move to floating islands far above the surface. 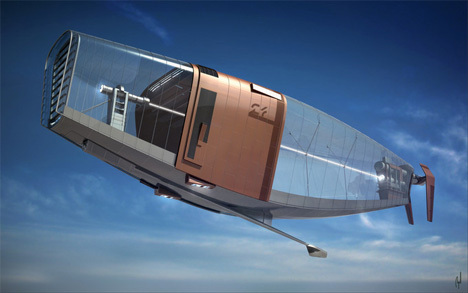 Emissions-free floating shuttles like the one above are the only way to travel between the surface and the islands. 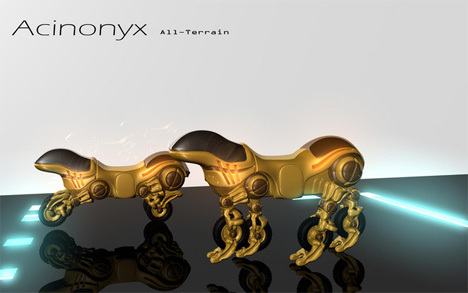 This ATV concept uses not only wheels, but animal-style moving legs to get over rough ground. 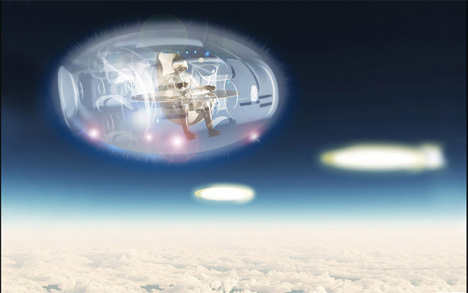 Its passenger pod holds the driver far above the ground, letting him spy trouble ahead. Likewise, the Acinonyx concept blends the features of animal and machine to make an all-terrain vehicle that can handle even the roughest ground. This concept takes a bit more of its influence from the animal than the machine, which results in a fascinating form. Crawling through desert worlds looking for suitable places for a human colony is a rough job. 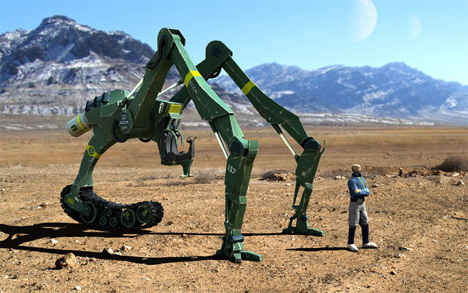 The Desert Mantis is a strange but rugged vehicle that uses its unique locomotion system to navigate any type of land. It can also be used to pull wagons of materials or passengers from one settlement to the next. Stationary hotels become a thing of the past in coming generations, when cruise ship-like floating hotels become more and more popular. Having the size (and most of the features) of a small city, the Atlantis II is a nomadic hotel that guests will never, ever want to leave. 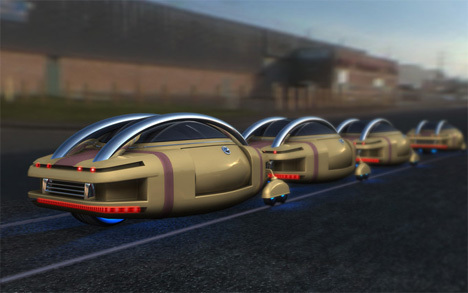 Four-wheeled cars take up so much space on the road and have mechanical limitations that make them impractical for use in the high-tech future. 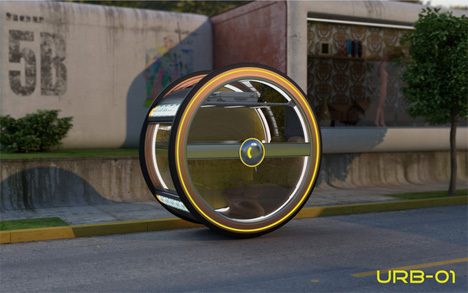 The Urb-01 is a two-wheeled gyroscopic city vehicle that makes commuting simpler and far more stylish. The two-seat car features a door that opens by sliding sideways. 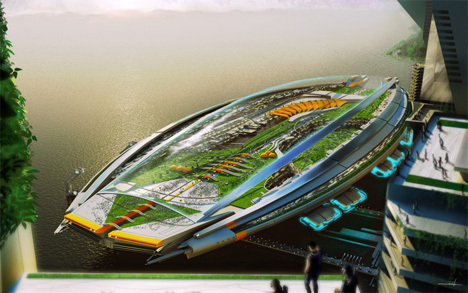 When human civilization moves underwater, we’ll need a new form of transport to get us between the water-bound cities. 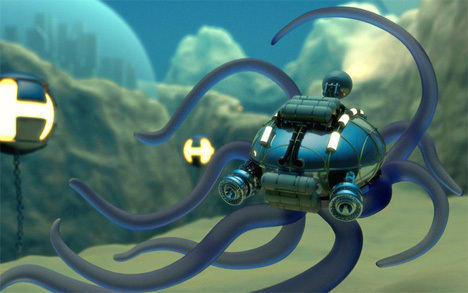 The Octopus is a balanced blend of organic elements and machinery that allow the driver to both propel the vehicle and provide defense with the tentacles made of organic materials.